Clockwise and counterclockwise rotation refer to a change in the electrical activity in a horizontal plane through the heart. Imaginge the observer standing at the feet of the patient who is in bed. If the electrical activity of the heart has turned more to the right side of the patient this is called counterclockwise rotation. If the electrical activity of the heart has turned more to the left side of the patient this is called clockwise rotation. 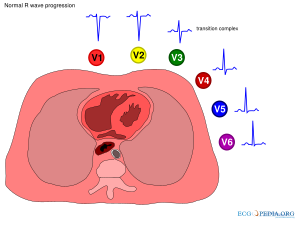 Clockwise and counterclockwise rotation can be assessed only in the chest-leads (V1 - V6). Normally the R wave amplitude increases from V1 to V5. Around V3 or V4 the R waves become larger than the S waves and this is called the 'transitional zone'. If the transition occurs at or before V2, this is called counterclockwise rotation. If the transition occurs after V4, this is called clockwise rotation. Several studies have been done to understand the anatomical substrate for these rotations. Tahara et al. have made CT-scans of 102 subjects to compare anatomic position of the cardiac septum and the electrocardiographic position of the transitional zone. Interestingly only 9 of 33 normal subjects had a normal transitional zone, which indicates that clockwise and counterclockwise rotation are not necessarily a sign of disease. This page was last edited on 14 July 2009, at 21:32.